BMW’s nomenclature is getting a bit wordy as of late. What used to be nothing more than a few numbers and the ubiquitous “iâ€ denoting fuel injection has recently morphed into an awkward amalgamation of marketing non-words and alphanumerics. More worrying still, the numbers appearing on the Bavarian automaker’s badges have begun to correlate to the engine’s displacement with relative infrequency. 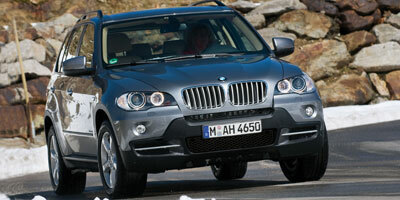 Take for example the 2009 BMW X5 xDrive35d. It’s a BMW X5, that part is easy enough. 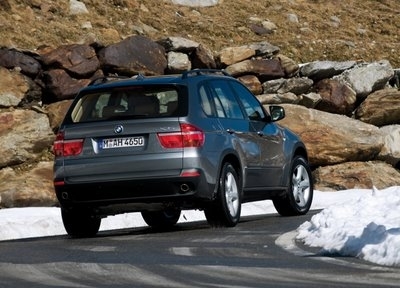 And xDrive stands for BMW’s intelligent all-wheel drive system, which isn’t too much of a stretch. Then things get ugly. 35d. Under old BMW rules we would assume that meant a 3.5 liter engine, but unfortunately that rulebook was thrown out a few years ago in favor of partial anarchy. What 35d stands for – and it’s actually really quite good so pay attention – is 3.0-liter inline six-cylinder twin-turbo diesel, and it’s a big part of what makes this car so great. 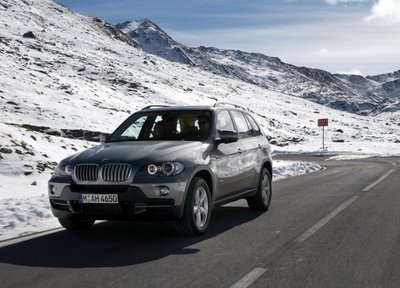 While the X5 has always been a great all-around package, one area in which it lacked was in the fuel economy department. But with diesel efficiency that’s all changed, as the X5 is now capable of delivering 26 mpg freeway while maintaining the low-down grunt which SUV buyers love. If you typically think of SUVs as overweight, lumbering vehicles with slow responses, you may want to consider recalibrating your ute impressions before jumping behind the wheel of the X5. While the diesel engine might not be the last word in outright revs, it more than makes up for its lack of peaky power with brutal low-down torque. With 425 lb-ft available at a lowly 1,750 rpm, the engine engine’s massive twist is able to haul the 5,225-lb X5 from 0-60 mph is just 6.9 seconds. While that might sound lackadaisical to your average M3 driver, for a diesel-powered SUV it is deeply impressive. Steering is typical BMW, by which we mean well weighted, accurate and quick to respond. Grip is ample – thanks in no small part to the xDrive system – and body roll is minimal, leading to relatively flat and predictable cornering balance. BMW’s iDrive system comes standard, and while we’ve heralded the new version as a substantial achievement in usability, technological integration and, er, common sense compatibility, the X5 remains stuck with the old system. Despite the inclusion of the iDrive screen from the get-go, you’ll still have to shell out for a tech package to get navigation with real time traffic. Still, the system works great with iPods, and once you get over the learning curve it’s easy enough to live with. The tech package also includes Park Distance Control, a cool technology that not only beeps as you approach objects, but graphically displays the radar returns around an image of the car. Despite its high torque output, the BMW X5 xDrive35d manages 19 mpg city, 26 mpg highway thanks to the efficiency of its diesel engine. While that may not initially come across as supremely impressive, keep in mind this SUV does in fact weigh a portly 5,225 lbs without passengers. The X5 xDrive35d is set apart from the 3.0-liter gasoline car by its lighter colored grill – which is also present on the 4.8-liter model – and a few xDrive35d badges. Exterior design remains relatively timid now that the obnoxious X6 has been with us for a year or so, but the flared wheel arches do lend a sense of aggression to the X5. At $51,200, the BMW X5 xDrive35d may sound pricey, but that actually represents a price premium of only $3,700 over the base model X5. Factor in a $1,800 tax credit and that premium shrinks below the $2K mark. Its main diesel competitors include the Mercedes-Benz ML320 BlueTEC ($48,600), Audi Q7 3.0 TDI Premium ($50,900) and Volkswagen Touareg TDI ($42,800). Domestic competition comes in the form of the $50,455 Chevrolet Tahoe Hybrid. 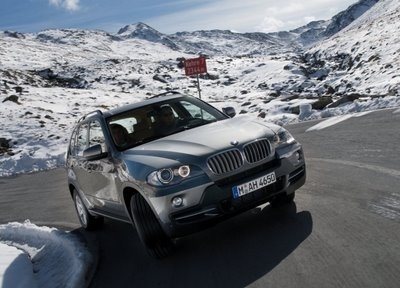 The X5 xDrive35d looks to be the short-term solution for fuel-conscious luxo-SUV buyers. We understand that some people will always want a big car with a powerful, loud V-8, but aside from its diesel drone the 3.0-liter diesel delivers similar low-end grunt at a more reasonable price. Add to that a tall SUV chassis that’s actually somewhat nimble and you’ve got a winning package all around. Now, when does that iDrive update hit?